Albany Intl. - Philadelphia Intl. Atlantic City rests on Absecon Island, a summer vacation spot for the Lenni-Lenape, a group of Native Americans who were the first to be enthralled by this now world-class destination. 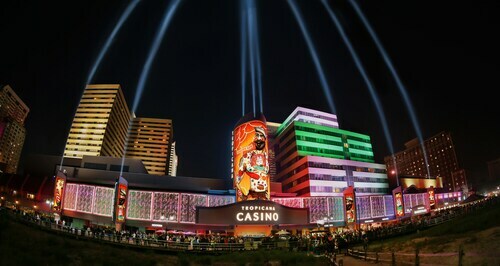 Atlantic City’s history dates back more than 200 years, foretelling the great future of this glitzy gaming destination. 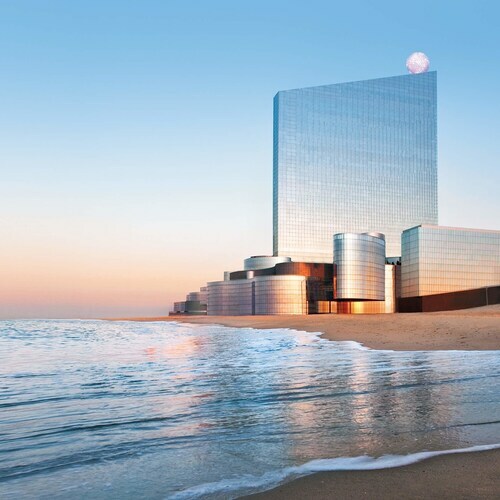 Atlantic City vacations take you to the heart of this New Jersey resort oasis. A city of only 12 square miles, it boasts one of the most talked-about boardwalks in the world, spectacular beaches, and award-winning structures. 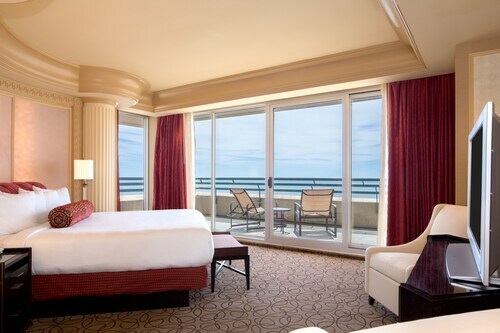 Curate a custom Atlantic City vacation package from our array of convenient airfare and luxury and affordable hotels. Consider these guest favorites as you plan your getaway. Tropicana Casino & Resort: The stained glass and marble columns in the Tropicana may have you convinced you’re in the midst of a religious experience. But no matter your belief system, one thing is for sure: the beautiful décor, in-house luxury shopping, and stellar location are just a few of this hotel’s best features. Walk to the historic Atlantic City Boardwalk and add a splash of high culture to your ocean view with an evening at Dante Hall Theater of the Arts. The Claridge - A Radisson Hotel: Every stay at The Claridge is a stately affair. From the vintage furnishings to the glittering chandeliers, even the smallest details are classic and refined. Located between two piers and just a block from the waterfront, this hotel is also the perfect place to be when you want to kick up your heels on the boardwalk or splash around in the sea. Harrah's Resort Atlantic: When a little grownup fun is what you seek, just look for the purple-lit exterior of this Harrah’s Resort. Enjoy playing the on-site slots and other gaming options just steps from your room, or take advantage of the proximity to Steel Pier and Snug Harbor—the latter of which isn’t as cozy as its name, but it does have lovely views. 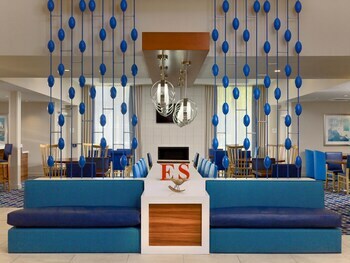 The Chelsea: When you want lavish, you stay at The Chelsea. The hotel marquee is, in a word, fabulous, and the interior is just as glam. Enjoy the ocean view from your room or sit back and close your eyes for a massage, body treatment, or facial at the in-house spa. When you do venture outdoors, walk along the sand or shop you way through the Pier Shops at Caesars in search of an elegant memento. Discover what the excitement is all about by visiting top-rated casinos, sights, and landmarks with affordable trips to Atlantic City for the entire family. Climb the Absecon Lighthouse, the third-tallest of its kind in the U.S., where marriage proposals have been immortalized on brass metal. 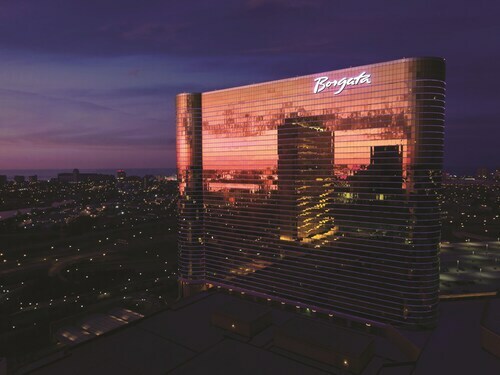 Whether you’re planning to pop the question to your special guy or gal or simply looking for romance, this is a must-see for any couple’s vacation in Atlantic City. Just a few yards away stands the expansive and world-renowned Atlantic City Boardwalk. There you will find the Steel Pier Amusement Park, luxury shopping malls, live music, and four miles of beautiful beaches. For a vacation in Atlantic City brimming with annual events, travel during the summer and make your way to the Boardwalk, such as Thunder of the Boardwalk Airshow. This event starts after the Fourth of July fireworks and is linked to a series of free music festivals held at the nearby Gardner's Basin. Some of the most soulful '70s and '80s R&B crooners are lined up for this musical extravaganza. The balmy midyear months aren’t the only times of celebration. If food is more your thing, stop by in March for the annual Atlantic City Restaurant Week, when the city’s culinary scene shines with bright flavors, brilliant menus, and beach views. 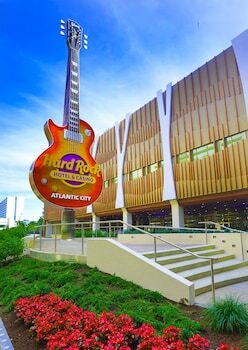 When the glittering lights of a vintage entertainment hub lure you toward the coast of New Jersey, book Atlantic City package deals with Travelocity. We will match a lower price and refund the difference with our price-matching guarantee. Only eight miles from New York City, Newark serves as the most populated city in all of New Jersey. It has long been a tourist destination for those who want the "big city feel" without the constant traffic of the Big Apple. Whether your Newark vacations are somewhat of a consistent getaway, or it's your first time visiting the area, you'll always find exciting museums, art galleries, and large music events to keep you occupied. Take a trip to central New Jersey to find the renowned city of Princeton. Bursting with culture and historical significance, this home of Princeton University holds far more than the famous Ivy League school. You'll also find incredible landmarks, stunning scenery, and rich culture. With Princeton vacation packages, you can visit this fascinating city and see for yourself all it has to offer. For the best in east coast charm and countryside landscape, visit Somerset County, a quaint town in New Jersey that's just a short trip away from New York City and Philadelphia. Enjoy countless options for Somerset vacation packages with the extensive list of flights and hotels. 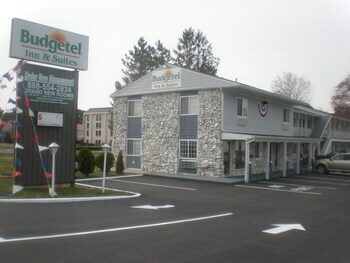 Parsippany vacation packages are a great way to save money on a wonderful trip to New Jersey. The town of Parsippany sits in the northern part of the state amid beautiful verdant hills. 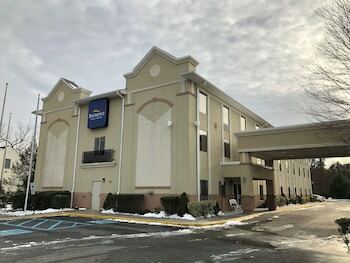 It's just 30 miles from Newark International Airport, and hotels in Parsippany are super-convenient to get to from Newark or New York City. 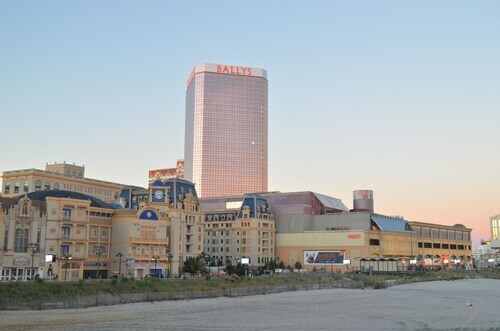 Located in Atlantic City, this beachfront resort is in the city center and within a 15-minute walk of Atlantic City Beach, Atlantic City Boardwalk, and Steel Pier. Tanger Outlets The Walk and Boardwalk Hall are also within 1 mi (2 km). Atlantic City Rail Terminal is 27 minutes by foot. Located in Atlantic City, this beachfront hotel is on the boardwalk and within a 10-minute walk of Atlantic City Art Center, Atlantic City Beach, and Atlantic City Boardwalk. Steel Pier and Atlantic City Hall are also within 1 mi (2 km). Located in the Renaissance Pointe area near the state marina, this Atlantic City, 43-story resort is about 2.5 miles from the convention center and the Boardwalk, as well as from The Walk shopping area. 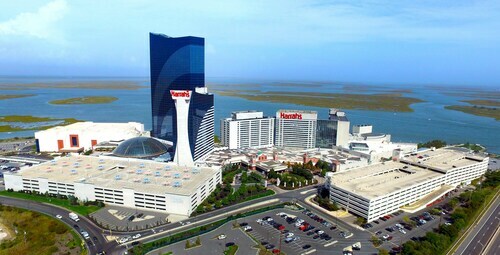 Harrah’s Resort Atlantic City is right on the water in the Marina District, 12 miles (19 km) from the airport. Harrah’s shuttle bus provides convenient transport to attractions like the legendary boardwalk, with its shops, casinos, and restaurants, less than 4 miles (6.5km) away.